"The taste goes down smooth, bitter spicy hops are more upfront, followed by a slight malt backbone, then “juice”. I have to say, every time I see this series hitting the shelf, my impulsive buying habit kicks in and I load my cart with 9 – 10 bottles. Never a buyer’s remorse.Just on a side note, I find in a bit odd that it’s a little harder to find in San Francisco, but I had no problem seeing it a ’plenty in places like Sacramento. Now for the Beer Review! Beer bottle is open, my beer glass is chosen (my token “Ruination IPA” glass; because again, I “Gotta” coordinate “somewhat”!) and it is poured. Pours a high-light yellow with a tinge of orange framing it. . Light lacing and thin white head. Medium carbonation. Smell is hops, 1st hit is the big and strong grapefruit. Second comes the lemon zest and 3rd punch is the pine resin. Stone, this is some fresh Schmidt. My nose hasn’t been punched like this since the 3rd grade in recess. The taste goes down smooth, bitter spicy hops are more upfront, followed by a slight malt backbone, then “juice”. Candy is the best way to describe this. The 9.4% alcohol is very well hidden, considering how easily this goes down. Very clean finish. 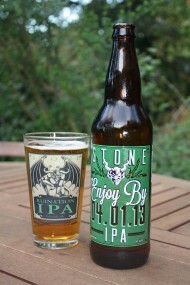 Enjoy By IPA – American Double| ABV 9.4% | $6.99 for 22 oz. Love the site, and definitely appreciate your thoughts on this beer! Has always been one of my favorites when looking for something that will kick your teeth out with hops. I wonder though, what happens if you drink it after the enjoy by date? I’ve heard that the hops go south and you lose a lot of the profile, but I’ve never been able to hold on to one of them long enough to find out!